At present Aldi are getting rid of their special buys in the run up to Christmas. There are loads of bargains to be had but this one really caught my eye. 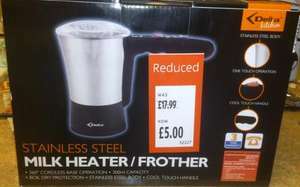 I have just bought the senseo deal off here and was looking at milk heater/frothers and the cheapest seem to be about £30 minimum up to £100 odd. So for £5 I thought I would bite their hand off - not literally I might add. It is a stainless steel body - which is eay to clean. One touch operation, cool touch handle apparently. But best of all 3 year warranty. This is in the Macclesfield store so can't vouch if nationwide but it won't hurt to ask in your local. There was about 10 left about an hour ago. Ha ha - rumbled!! I like my beer warm and frothy. Get them to check the price on the tills. I have seen deals on here that when I go instore the sticker/shelf label is different yet when scanned they are reduced. Just given this a try and it is very impressive. I tried using soya milk (alpro light) and it produced a nice frothy consistency with that as well.